Pens Universe got an awesome opportunity to chat with Alyonka Larionov, the host of the highly popular PensTV. She talks with us about growing up in the hockey world as well as how PensTV came about! Enjoy!! PU: Growing up as a "hockey child," what were some of your favorite memories? AL: Some of my favorite memories...running beneath the stands the morning after a game...we would find crazy things down there. Watching our dads' practice and then go out and skate with them after their morning practice. At the Joe Louis, Al Sabotka would always let us kids stand by the Zamboni gate to watch the game instead of sitting in our seats. Right before faceoffs, our dads would skate by and wink or smile at us. AL: I don't think it would be fair to say that it was hard but it was definitely different. When I was much younger, it was difficult to adjust to a new school and new friends but I think as I got older, I learned to take that as a positive. Every new city or school became a new experience and I always came out of that experience knowing a little bit more about myself which in turn made me a stronger person. I'm thankful for all the different things I got to experience, all the places I got to see and all the people I met along the way. It has been amazing. AL: As a kid of an athlete, especially for a girl, your dad's teammates almost become like your big brothers. So I don't think I can say that I had a favorite player growing up but more of a favorite big brother. There are a few. My first favorite big brother was Pavel Bure when he first came over to play for the NHL. Just like Sid lives with the Lemieuxs, Pavel lived with my family for the beginning of his time with the Canucks and he became like an extra sibling I could convince to play dolls or watch cartoons. Brendan Shanahan was more like an uncle to my sister & I because we would have movie and dinner nights. We'd choose a movie to see and then have dinner afterwards. We were always allowed to have as much pop as we wanted. That was the best. PU: I'm sure a lot of Pens fans think you have the ultimate job hosting Pens TV, how did that opportunity come about? AL: I made the choice to move to Pittsburgh and coincidentally at the time the Pens were looking for a host. I came to meet with the President, David Morehouse, auditioned for the part and got the job. Ever since, I've been hosting for PensTV. PU: Of all your Pens TV episodes, do you have a favorite one? AL: Hmm. Interesting question.. I really love all the fan segments we put together particularly the St. Patrick's Day Segment. My producer (Stephen Finerty) and I headed out to a then unknown Southside (I was fresh from LA.. wasn't sure what the Southside was..) and participated in a Pittsburgh St. Patrick's Day. We were out from 8 a.m. talking to fans who had begun tailgating for the Pens game later that day. Now that's dedication. Cooking with Geno is an obvious. I also love my endings for the Penguins Show. I always try to close the show in a different way and now that we've incorporated 'The Russian Word of the Day'.. it's that much better! PU: Any particular player you enjoying interviewing or working with the most? AL: Geno is always fun. He has an amazing sense of humor and personality. He's down to earth and never has the superstar mentality. Billy Guerin is a riot. He has so much fun with the everything he is apart of and that makes my job that much more interesting. Coach B because he always has a great story. The nicest guy to work with?.. Tyler Kennedy.. he'll always give an interview and he's always polite. All the guys are great but those are some of my favorites. PU: If you weren't hosting Pens TV, what would you be pursuing as a career? AL: I believe in pursuing happiness and right now I'm happy working for the Pens. As long as I'm happy..this is where I'll be. PU: Thank you very much for taking out the time of your busy schedule! AL: Thanks for thinking of me! Recently the Pens launched “NHL in Russian,” a Russian-language radio show which airs on the Penguins’ new HD radio station, 105.9 HD-2, and will be streamed live on www.pittsburghpenguins.com and www.nhl.com. 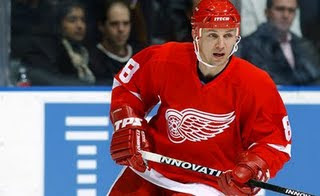 Miss Larionov is a part of the "NHL in Russia" radio crew. Their first show was this morning actually and they interviewed Pens superstar center Evgeni Malkin. Check out the transcript of the interview here.